11 Critical Wedding Day Beauty Tips! If there’s one day you want to pay extra attention to your beauty routine –whether or not you’re a low-key bride or a bridezilla– it’s your wedding day. You may not want all the attention and focus to be on you, but there are a few things you can do to ensure you have wedding photos you’ll be proud to show off in the years to come. Read on for the 11 worst beauty mistakes you can make on your wedding day. 1. Not looking like you. Whether it’s overdone foundation or trying to lose too much weight; you want to look like the best version of yourself on your wedding day not an extreme makeover contestant. 2. Caking on foundation because it will look better in photos. Step away from the cake foundation step very far away. Packing on the makeup looks fine on TV hosts, due to the harsh studio lighting, but in a natural setting like a beach or garden wedding it doesn’t look natural. 3. Getting your ‘friend who’s great with makeup’ to do your makeup. One of the most important people you can hire for your wedding is a makeup artist. A professional knows the right way to contour your face, the correct shades, and has the right products (primer, fixing spray, lip stains) in their kit to ensure your makeup lasts all day. If you don’t have any recently married friends to ask for recommendations a good place to start is wedding forums and make-up artist agencies. If you are lucky enough to count a makeup artist as a friend, don’t be afraid to speak up if they haven’t nailed the look you want. They may think a bold red lip looks great, but if it’s not you then ask them to other shades. 4. Not doing trial runs. You wedding prep mantra should be: try, try and try again. If you’re not entirely confident with the hairdresser, try another one. If you think there’s a possibility your make-up artist might turn up late or be extremely hungover, try another one. 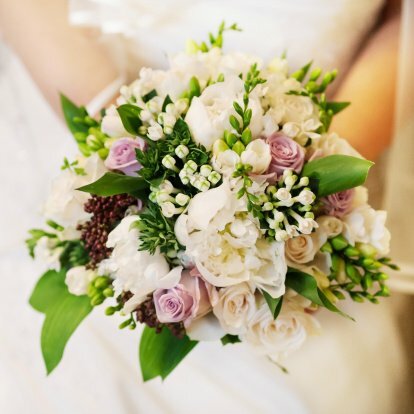 It’s Murphy’s Wedding Law (yep, I made that up) that anything that can go wrong will go wrong – for me, it was my Maid of Honour’s frozen zipper – but having trusted professionals on hand will ensure the day is as smooth and effortless as humanly possible. 5. Not wearing false lashes. I know this may sound OTT to some of you, but eyelash extensions or individual false lashes (applied with clear glue!) are better than any waterproof mascara. Even if you’re not a crier, you don’t want to be surprised with panda eyes. Sure you want glowing skin on your big day, but do you also want to spend your wedding night sitting on the loo? Didn’t think so. Finish up any cleanses at least three days beforehand. 7. Not using a deodorant you trust. In clinical deodorant we trust; I got hitched before this type of deodorant existed, thus you could’ve found me mid-way through the night with a baby wipe and deodorant stick in the ladies room. I wouldn’t recommend a clinical deodorant for everyday use, but it’s a must for your wedding day. I only narrowly avoided this one. As it turned out, my most trusted beautician was crap at giving fake tans under pressure. Luckily, I tested her a week before my wedding day, and cue some serious sugar scrubbing and desperate begging I got a spot with a spray tan specialist whom I knew I could completely trust. You don’t want to look back at photos and see an orange version of yourself – so experiment with tans and/or technicians until you’re confident. 9. Not packing a touch up kit. You’ve got your besties on hand to help you celebrate your big day, so have one of them to carry a touch up kit for you. What should be in there? Blotting paper, to absorb extra oil, lipstick, deodorant, bobby pins, breath mints and perfume. 10. Looking like the rest of your wedding party. Generally speaking, your bridesmaids will have matching dresses, shoes, bags and jewellery but one thing you don’t want to match is the same make-up as you. If you want to wear a smoky eye, have your bridesmaids wear a softer smoky eye or stick to a more natural lip colour so that you stand out in photos. 11. Forgetting your mum or mum-in-law. With all the focus on you and your bridal party your mum and/or mother-in-law can get lost in the noise. Chances are your parents are contributing to your big day, and this is as much of a big deal to her as it is to you. A lovely thing to do is to pay for them to have their make-up done on the day, and make sure you set some time aside to check in with her on the night.